Polymer nanocomposites (PNC) are materials that are made up of a polymer matrix with embedded particles with a size of 100 nanometers or smaller. Carbon nanotubes or nanofibers, graphenes, and nanoclays are typical nanoparticles. Polymer nanocomposites exhibit enhanced properties than unfilled polymers, making them interesting for a variety of technical applications. The desired properties, in particular, are the greater mechanical strength of polymeric materials combined with low weight. Furthermore, the incorporation of nanocomponents can result in an enhanced chemical and heat resistance as well as electric conductivity. Currently, polymer nanocomposites are often used in the aviation and automotive industries, as well as in construction materials for windmill blades. Polymer nanocomposites can be formed by mixing the nanoparticles into the molten polymer matrix using extrusion. Using nanoparticles that are predispersed in a carrier liquid and feeding the dispersion into the extruder is one way to achieve proper mixing during the extrusion process. The composite material exhibits the desired properties, only when the particles are distributed homogeneously inside the polymer matrix without forming any larger clusters. Dynamic mechanical thermal analysis (DMTA) can be used to test the mechanical properties of a polymer nano-composite. DMTA can be carried out in torsion with a rotational rheometer. When the temperature is continuously changing, the material is exposed to oscillatory shear. The obtained data is used to find out characteristic phase changes such as the occurring of melting and crystallization or the glass transition. Additionally, DMTA is used to determine the mechanical performance of solid material with significant application related properties, for example brittleness, stiffness, impact resistance, or damping. The rheological parameters such as loss modulus (G’’), storage modulus (G’), and the loss or damping factor (tan δ) are obtained from DMTA. The loss modulus represents the viscous properties, and the storage modulus represents the elastic properties of a material. For fluids, the storage modulus is smaller than the loss modulus and vice versa for solids. The ratio of G’’ and G’ is the loss factor and is also a measure for the damping properties of a material. The schematic diagram for DMTA on a semi-crystalline polymer is illustrated in Figure 1. There are different approaches to identify the glass transition. The most common approach for rheological tests uses the maximum of the loss modulus (Figure 1). Two alternative methods are the maximum in the tan δ (G’’/G’) or the onset of the decrease of the storage modulus. Polymer nanocomposites are usually in the glassy state at room temperature and show high values for G’, which signifies the high stiffness of the material. Polymer nanocomposites show higher G’ values in the glassy state than unfilled polymers, denoting their greater mechanical strength. At temperatures way below the main glass transition, smaller phase transitions can take place for copolymers and polymers that carry side chains. The extra peak in the damping factor can enhance the impact resistance of a polymer. High impact polystyrene (HIPS), an engineering plastic with a polystyrene backbone and rubber side chains, would be an example of such a material. Figure 1. Schematic drawing of dynamic mechanical thermal analysis results of a semi-crystalline polymer. The Thermo Scientific™ HAAKE™ MARS™ rheometer can be equipped with a solids clamping tool to extend its range of testing methods into the field of composites and other solids. The Controlled Test Chamber (CTC) provides the temperature control for this setup (Figure 2). The patented design of the CTC, using a combination of convection heating and radiation heating, creates a large uniform heating zone inside its gold plated test chamber (see Figure 2), thus enabling testing of larger samples under uniform temperature conditions. 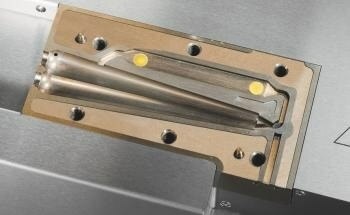 The solids clamping tool can be integrated with special jaws for soft, medium, or hard samples. With the hard samples, the jaws can even fix hard composite materials with smooth surfaces during oscillatory testing. Thanks to the unique design with two moving jaws, the solids clamping tool automatically positions the sample in the axis of the rheometer, which is compulsory to avoid any error from eccentric placement. Two different composite materials were tested using the CTC, HAAKE MARS rheometer, and solids clamping tool. A lightweight carbon fiber enforced material, which could be employed, for example, in airplane construction, was the first sample. A glass fiber enforced polyphenylene-sulfide (PPS) was the second sample. Such materials are used for applications where a high thermal and mechanical stability are needed. DMTA was carried out with both samples. The carbon fiber enforced material was tested in a temperature ranging from -100 °C to +240 °C. A constant oscillatory deformation γ of 0.1% was applied with a frequency of 1 Hz. A constant axial force of -1 N (pulling force) was applied during the entire test. The glass fiber enforced PPS was tested between 30 °C and 250 °C. A constant oscillatory deformation of 0.01% was applied at a constant frequency of 1 Hz. The axial force was kept constant at zero Newton during the tests. All tests were carried out with a heating rate of 2 °C/minute. Figure 2. Solids clamping tool with carbon fiber enforced composite sample. The results of the DMTA tests with the carbon fiber enforced sample are shown in Figure 3. The data shows the high stiffness of the material at room temperature, with a storage modulus G’ of over 3 x 109 Pa. The results also reveal three transition temperatures of the sample represented by the local maxima of the loss modulus G’’. The biggest change of the rheological properties takes place between 80 and 150 °C. The two maxima of G’’ at 99 °C and 115 °C signify the glass transitions of two different components in this temperature range. The excellent reproducibility of the test results was shown by comparing the results of two independent tests run with two different specimens of the same material. The two sets of curves shown in Fig. 3 are almost perfectly identical. During the measurement, a constant small pulling force was applied on the sample by the rheometer to compensate for any thermal contraction or expansion (see black curve in Figure 4). This causes a lift motion of the rheometer that reacts to any change in sample length. This information can be used to verify whether the clamps might have lost their grip or were able to hold the sample. In a plot of the sample length as a function of temperature, any slipping of the sample between the jaws of the clamps would show as a step-change. The smooth progression of the orange curve in Figure 4 indicates the steady grip of clamp even on such a hard material. Besides its diagnostic value, the data shown in Figure 4 contains valuable information about the sample itself. As the temperature increases, the length decreases, reflecting the negative temperature expansion coefficient (α) shown by some carbon fiber enforced materials in fiber direction. It can be observed from the change in slope that the negative temperature expansion coefficient (α) of the material changes around the major transition temperature starting at 80 °C. The results of the DMTA tests with the glass fiber enforced material are shown in Figure 5. Moreover, this material shows a high stiffness at room temperature with a storage modulus G’ of above 3 x 109 Pa. The glass transition temperature, denoted by the maximum in the loss modulus G’’, was taking place at 101 °C. Above the glass transition temperature, the material is transformed into a rubber elastic condition, where the moduli data changed less with increasing temperature. Also for this measurement, the sample length over temperature plot reveals the perfect grip of the solids clamping tool. This material has a positive thermal expansion coefficient when compared to the carbon fiber enforced sample which does not change around the glass transition temperature. From the data in Figure 5, a constant coefficient of approximately α = 3.3 × 10-6 K-1 can be calculated. Figure 3. Storage modulus G’ (red), loss modulus G“ (blue) and tan (δ) (green) as a function of temperature for the carbon based sample. The glass transition temperature TG is indicated by the green line. The results of 2 independent tests (open and filled symbols) run on fresh samples each, show the excellent reproducibility of the results. Figure 4. Constant normal force (black) and decreasing sample length (orange) during a temperature increase from -100 °C to 240 °C on the carbon fiber enforced sample. Figure 5. Storage modulus G’ (red), loss modulus G” (blue) and tan (δ) (green) as a function of temperature for a glass fiber enforced PPS sample. The glass transition temperature TG is indicated by the black line. Figure 6. Constant normal force (black) and increasing sample length (orange) during a temperature increase from 30 °C to 250 °C on one of the glass fiber enforced PPS samples. 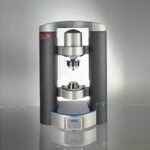 The unique design of the solids clamping tool accessory for the HAAKE MARS rheometer integrates easy handling with high precision and perfect reproducibility of test results. Various composite samples with very hard and smooth surfaces have been tested and both have given very good results. The combination of rheometer’s lift and normal force sensor and the solids clamping tool provides an easy way to check the perfect grip on the sample and thus the reliability of the data collected. Thanks to the unique precision of both lift and normal force sensor, important data about the thermal expansion of the samples can be collected at the same time. This makes it possible to, for instance, calculate the thermal expansion coefficient of the sample. The HAAKE MARS rheometer, with the solids clamping tool and Controlled Test Chamber, can extend its range of testing capabilities into the field of dynamic mechanical thermal analysis. With the combination of the classical rheological setup like cone & plate geometries and a Peltier temperature control module, the HAAKE MARS rheometer provides a perfect, cost-effective solution for testing polymer composites and their liquid base materials on a single instrument.